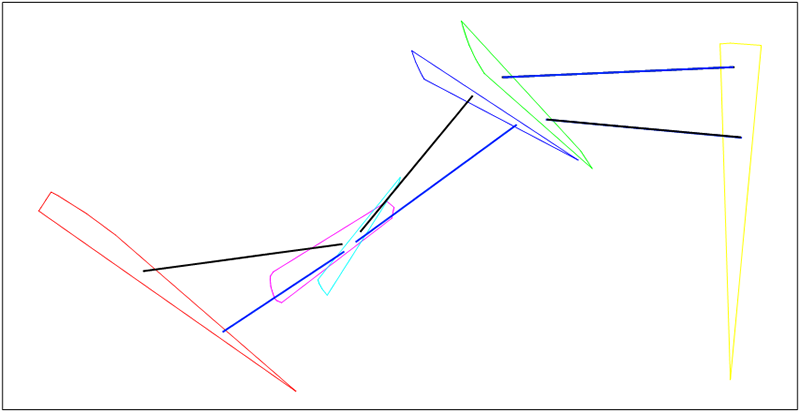 set of chromosomes which are used on current iteration (a collection of composite routes). one instance of separate GA with its own characteristics. number of iterations conducted before a migrations is performed. (20 iterations by default in Debrief-SATC). 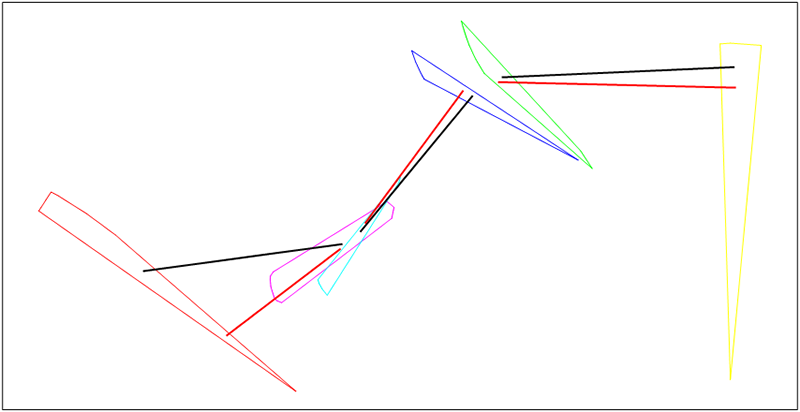 To allow multiple parallel threads of solution derivation, an Islands Model (Multiple-population GA) is used, with synchronized migrations (http://tracer.uc3m.es/tws/cEA/documents/cant98.pdf). This involves several separate populations which are optimized in parallel. After each epoch the islands exchange chromosomes between each other. Each island is separate GA with its own characteristics. Our islands structure is shown on Figure 20.4, “Islands structure”. 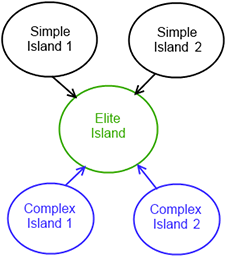 The figure shows two simple and two complex islands. These are designed to produce good candidates from random search area. After each epoch every of simple and complex islands sends 5 elite individuals to elite island, which chooses the best candidate from these islands and optimizes it. The presence of different types of island allows the algorithm to produce an optimal solution across a range of problem types. Each island is one instance of GA with its own parameters. The different island types have different strategies for Selection, Crossover, and Mutation. Completion - the GA stops evolving after one of two criteria: time elapsed (typically set to 30 secs), or stagnation (where the optimal solution stops showing improvement in successive generations). The Candidate Factory generates an initial set of candidate routes (individuals) within the problem space, together with further randomly generated routes. No specific algorithm is used to generate initial population, it simply generates the required number of random solutions according to the following steps. Usually start and end polygons contain part of corresponding bearing line. 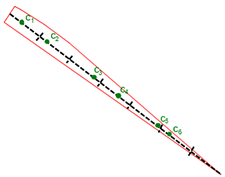 When present, the target bearing measurement is the most effective observation on the target track, so the best solutions start with initial points on this line. 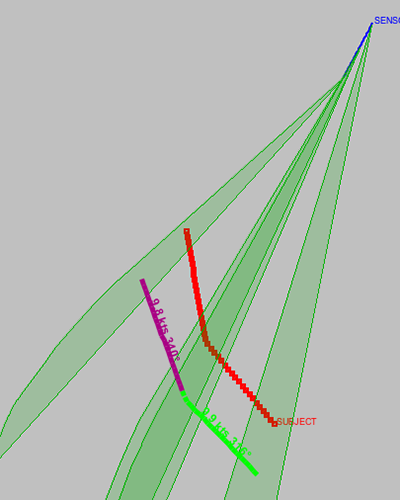 Where the polygon does contain part of bearing line this line splits on multiple segments and the candidate factory takes a random point from each segment consequentially, as shown on Figure 20.5, “Bearing lines for new points”. When the candidate factory needs to generate a point for above polygon it takes first segment and generates c1, when it needs a new point again it takes second segment and generates c2 etc. 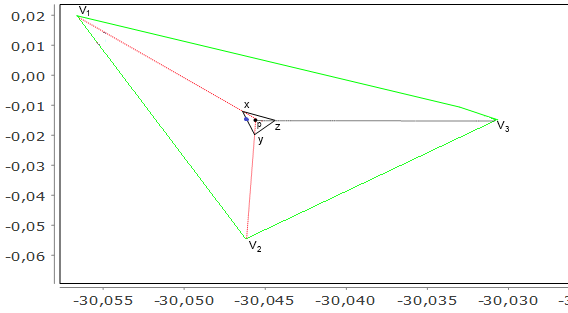 On occasions when the start or end polygon doesn't have part of corresponding bearing line (there is no sensor data for that time), the candidate factory generates a grid of points for this polygon, it applies a grid to the polygon then takes a random one each time, as in Figure 20.6, “Polygon without bearing line”. To select the chromosome to use in genetic operators we use tournament selection (http://en.wikipedia.org/wiki/Tournament_selection) with tournament size = 2 and a probability to allow the worse candidate, depending on the island type. Two types of genetic operator are used: crossover and mutation. Crossover is genetic operator which is used to produce new chromosomes based on crossing two parent chromosomes. There are several techniques to implement crossover, we use two of them: one-point list crossover and arithmetic crossover. Because the above formula restricts a new gene to be between its parents, several authors propose extending the random number interval to [-d; 1 + d], where d is parameter which allows new gene to go outside. Usually d is less than 0.25. In our application we will use the following implementation of arithmetic crossover. Initial parameters: two parent chromosomes P1, P2. 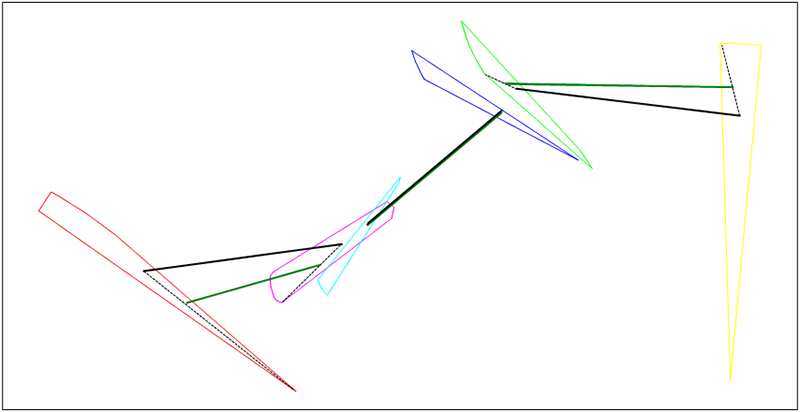 For our example from Figure 20.3, “Example”, we generate new chromosome (green) with arithmetic crossover. The goal of mutation is to produce individuals which aren't present in current population - thus individuals that aren't achievable by crossover. Mutation is a genetic operator which produces new chromosomes by substituting genes in parent chromosome for newly generated ones with some specified probabilit. The specific mutation used in a GA instance depends on an understanding of the problem domain and data patterns.In our implementation we will use two techniques. Mutation to vertex comes to GA from Debrief's experimental Simulated Annealing (SA) optimized point generation implementation (see Section 20.3.5.4, “Optimised point generation”), this algorithm gives good results for SA optimization and there is value in also using it within GA with some specific modifications. 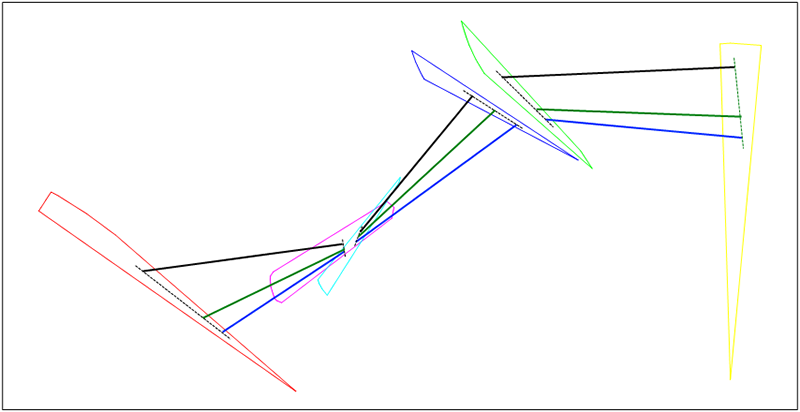 Example: Parent chromosome X (black), new chromosome I (green). Mutation was made for first and third genes. The development of the semi-automated TMA in Debrief included some investigation into the value in Simulated Annealing (SA). In support of this, algorithms were developed that related to the Very Fast Algortihm (VFA) strategy for producing an improved SA temperature function. If current polygon doesn't contain Pnew point go to step 2.
b) score how altering route is compatible with its previous and next straight routes. The detail of the a) scores is described in the Debrief-SATC contribution documentation. Score b) is very effective in producing a solution that is the sum of consistent straight line legs. It's quite easy for the GA to produce a solution that is the collection of the best performing individual legs, but where the legs aren't consistent with each other. 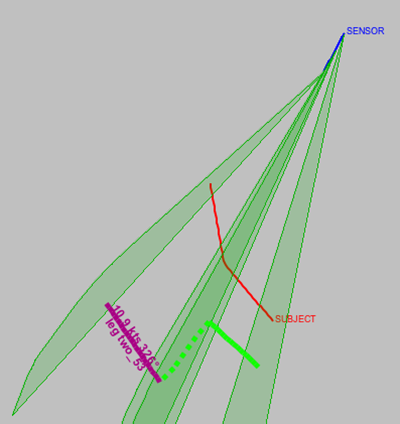 In Figure 20.13, “Inconsistent range” it is clear that whilst the green and purple legs are both valid, they aren't consistent with each other. 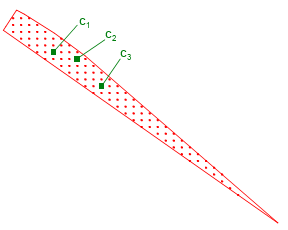 Figure 20.14, “Consistent legs” demonstrates the inclusion of the consistent legs scoring - used to verify that it is possible for a vehicle to transition between the two legs in the available time. Note that in Figure 20.14, “Consistent legs”, the solutions still don't match the true ("SUBJECT") track - that requires further contribution from the analyst. 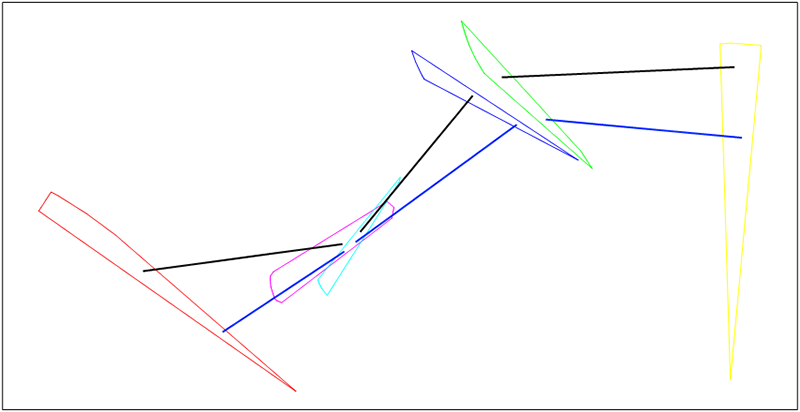 But, the legs in the solution route are consistent with each other. To score how well altering route is compatible with its previous and next straight routes the GA fitness function uses speed changes during alteration. The only difference between simple and complex island is simple islands use only straight legs and DON'T use altering ones, and complex islands use altering legs too.